Meet the coolest corridors on the block. No matter how much square footage your tiny kitchen lacks, its decorative integrity is something never worth compromising—galley kitchens included. While they might seem entirely hopeless and may not have the same appeal as one belonging to a master chef, your seemingly less-than-ideal nook has more design potential than you might think. Even the most narrow galley space can be transformed into the kitchen of your dreams. With a little reorganizing and a lot of TLC, the kitchen you once considered a hindrance will soon be the epicenter of your home. Clever tricks of the trade, coupled with a few illusionary hacks and decorative upgrades to boot, can help turn even the most tired and cramped kitchens into the ultimate culinary hub. Need a little inspiration? The fresh spaces ahead will have you viewing your tiny kitchen in a whole new light—and pining for a little reno of your own. See for yourself. Distract the eye with a daring detail—a dramatic backsplash is definitely one way to go about this. Bonus points for implementing a unique format for the tile placement, for an added visual layer. Throw in a vintage rug for a practical yet stylish appeal. Not only will it instill the space with a vibrant splash of color but it will bring in a bold dose of character as well. Pick a style that is classic to ensure a timeless appeal. Though it might not seem intuitive at first, exposing your shelves will visually open up your teeny setup. In her 265-square-foot East Village apartment, chef Lauren Gerrie opted for a no-fuss look so she can see and snag her various kitchen equipment with ease. Warning: Said arrangement will require you to tidy up after every cooking sesh. Talk about kitchen cabinet envy. Crafted from the wood parts of the roof and floors of the home that stood there before, this mod-meets-rustic Amsterdam kitchen makes a serious case for using discarded and recycled materials. Cleverly hidden cabinets and drawers beneath the stairs make the most of otherwise wasted space, while sleek contemporary light fixtures balance the raw, industrial mood. Of all the cramped kitchens (though technically, this one is not galley-style) inspiring us to live small, this dreamy home in Austin, Texas, takes the cake. Small space-friendly swaps—like designating the large farmhouse sink as the catch-all for dirty dishes as opposed to a dishwasher and installing solid wood countertops for cutting and prepping—make a world of difference. AGo bold with brass. Commonly, kitchens feature nickel accents. Change yours up with brass pieces. These brilliantly bright pieces pop against the white cabinets and elevate a utilitarian space. Think practically. Add a chalkboard wall into your kitchen. It is the perfect space to track grocery store lists and weekend plans. Write some inspirational cooking quotes on your wall when in need of some uplifting encouragement. Refinish your original floors. While tile still reigns supreme in kitchens, that doesn’t mean you can’t work with the existing hardwoods. Keep your colors fresh. A monochromatic color scheme works in a smaller space. Paint your walls and cabinets white to achieve this look. Consider the neighboring spaces. If you are planning on doing a great deal of hosting, style the adjacent spaces accordingly. Invite guests to wander on out to your backyard after mealtime. Open shelving is nothing new. It is not only an affordable option but also a stylish one. This look is not for the messy people of the world. Neat-nicks unite! We’ve found a way to show off your knack for organization! An apron front sink is on nearly everyone’s wish list! Put this splurge-worthy option in your space. Find another place to save to keep your budget balanced. Black and white is a striking combination that we’ve been gravitating towards lately. If an absence of color is your jam, kick it up with this colorless kitchen. Hidden hardware is always an option for those who like to keep things streamlined. Consider this style if you’re working with a minimalistic space. Decorate with flowers. This idea is a no-brainer. Fresh florals will help to liven up any space, but particularly a stark white kitchen. Build in a little bookcase. 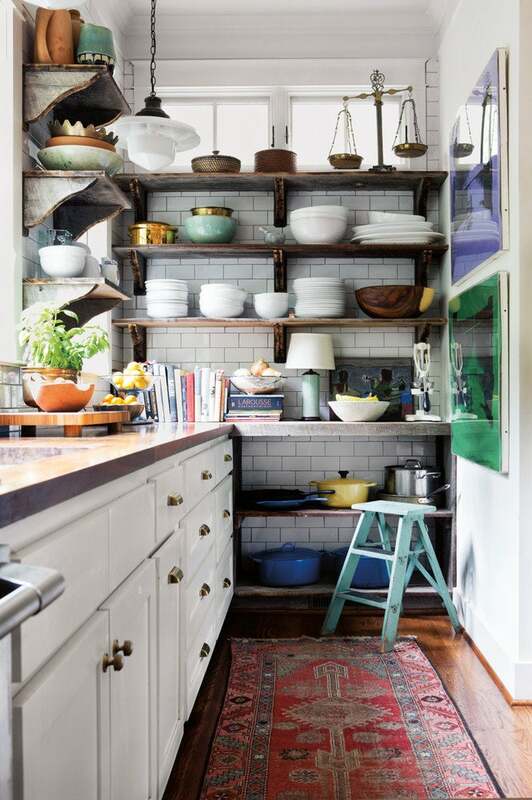 Even if it’s tucked in at the end of a cabinet, a small set of shelving provides practical storage while allowing you to show off your colorful cookbooks. Add art. Even just one piece can give you a lot of look in a tight kitchen space. A fresh floral painting adds some life to this space. A fresh aqua tone is unexpected but beautiful. Paint your cabinets a subtle pastel tone; this small space can handle it! If your dishes are going on display, make sure they are a complete collection. Believe it or not, a basic white set is all your space needs. Don’t forget the color! Sure, it’s easy to go basic in a kitchen, but if you’re a color lover, here’s a place to play with it. Keep your eating space separate. Use your galley kitchen for prep work and cooking, but have a set up neighboring the space for the actual event of dining. Pick a cool chevron tile for your backsplash. Someone with a larger kitchen may not be able to cover their wall space with such a fun look. This story was originally published on April 18, 2016. It has been updated with new information.